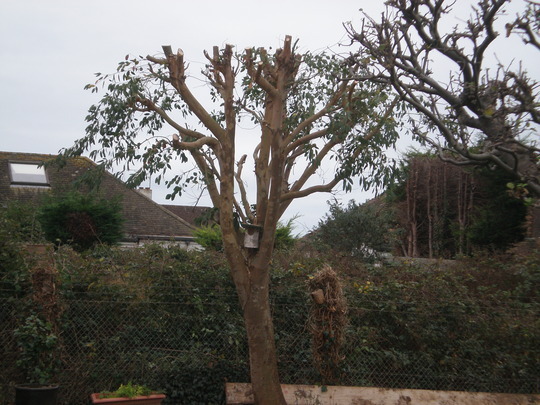 Today we had our Eucalyptus tree trimed or scalped this is what it looked like first. This is what it looked like after, so much lighter now on veg garden. Sorry I haven’t been around much only back in November I had a full knee replacement, I’m slowly getting there, roll on the spring. I wish you all a Happy New Year and hope it’s a good one for everyone. We had a very quite but enjoyable xmas day. Previous post: Winters arrived Brrrrrrrrr. Next post: Happy New Year to you all. I reckon I can definitely add this blog to GoYpedia Pruning ! Glad the work has given you more light on the veg. garden. Always looks a bit drastic , doesn't it ? Here's hoping for super - veg ! Happy 2012 . 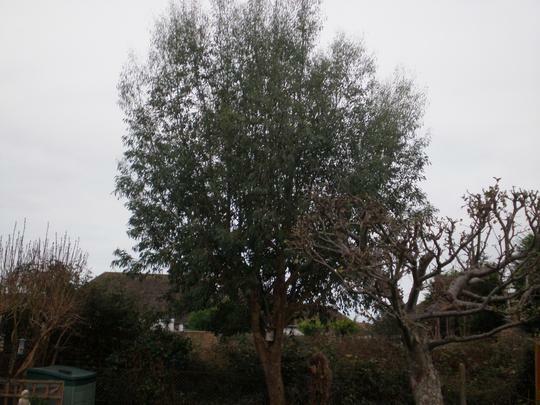 Wow thats well pruned. Be good for the veg garden though. Ouch knee replacement, thats not fun. My OHs mum had the surgery about 3 weeks ago, knocked her about a bit. Glad to hear your on the mend. Thank you all for your remarks, yes Samjp it's a very painfull op, thanks Terratoonie for putting it on pruning blog, same to you Stickitoffee for 2012.